Cast- Akshay Kumar, Radhika Apte, Sonam Kapoor & Amitabh Bachchan (Cameo). 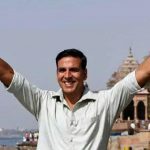 Almost six months after Toilet: Ek Prem Katha, superstar Akshay Kumar is back with his another content driven film tilted PadMan that also dares to change the age-old thinking of our society. Directed by R.Balki, this comedy-drama is inspired by the life of Tamil Nadu based social activist Arunachalam Muruganantham who created low-cost sanitary pads for the women of rural India. 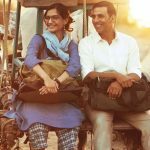 The storyline of PadMan resembles with Toilet: Ek Prem Katha, where the change that a husband wants to bring in society for the welfare of his wife and other women, causes separation in their relationship and at the end, they unite back. The major difference is, in TEPK the issue was a toilet and here the focus is on sanitary pads. The film starts with the wedding of Lakshmikant Chauhan (Akshay Kumar) and Gayatri (Radhika Apte) supported by a song ‘Aaj Se Teri’. Lakshmi loves her wife very much and takes care of her every need. He shows concerned about her health and asks her to use sanitary pads during periods instead of a dirty cloth. When Gayatri refuses to use costly sanitary napkins, Lakshmi tries to make napkins by himself. With every failed attempt, his concern becomes an obsession, because of which villagers start pointing a finger on his character. What happens next, makes rest of the film and must say the second half is better than first one. Talking about the acting, undoubtedly Akshay Kumar has given one of his best performances so far. He has played his character with complete dedication and surely deserves an award for this. The leading ladies Sonam Kapoor and Radhika Apte, both have justified with their roles superbly. The direction of PadMan is done by R.Balki and making a full-fledged film on such a taboo subject is truly appreciatable. Music of the film is given by Amit Trivedi and it is decent because of one repeatable song ‘Aaj Se Teri’. The screenplay is OK but editing could have been better definitely. But still, it’s a must-watch film, can be enjoyed with everyone. Review of Akshay Kumar, Radhika Apte, and Sonam Kapoor starrer PadMan. Directed by R.Balki, the movie is inspired by the life of Tamil Nadu based social activist Arunachalam Muruganantham who created low-cost sanitary pads for the women of rural India.